We no longer accept credit card payments except for camp. You may use a credit card to secure your reservation with a deposit, but no credit cards or checks will be accepted when paying your balance at our farm. Dead Broke Farm’s mission is to provide horses and trails for people who love horses and riding but can’t have horses of their own. We offer a safe environment where you can come to ride without having to register for a series of lessons requiring a significant investment in time and money. Our passion and love of horses in conjunction with our desire to share that experience with others has resulted in our use of many horses that we rescued from terrible conditions of neglect, abuse, and even death. We’d like to share some of those rescue horse stories with you. But if you've been dreaming of owning your own horse, we have some nice trail horses for sale right here in Raleigh, NC. 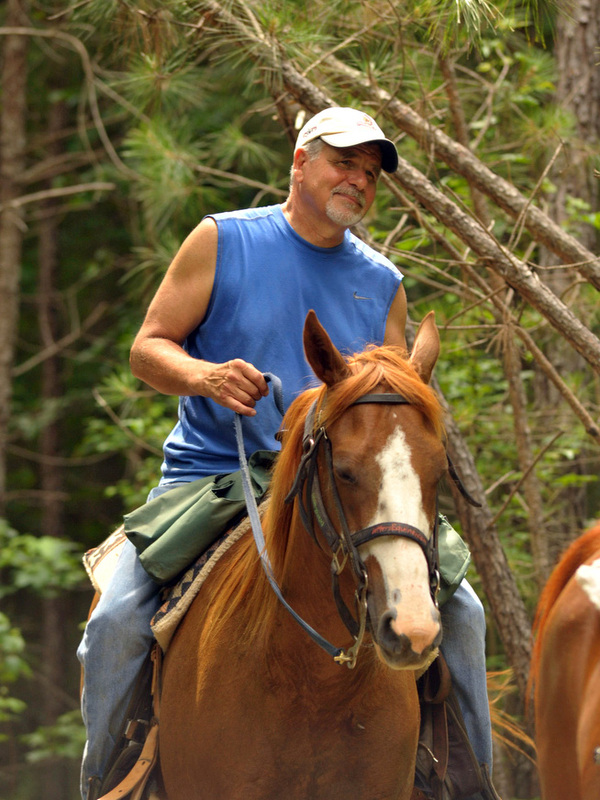 Located on 110 rolling, wooded acres in the Raleigh / Durham / RTP area, Dead Broke Farm offers you the opportunity to experience North Carolina's beauty in the most natural way - by horseback! Safety is an important consideration in all our riding programs. 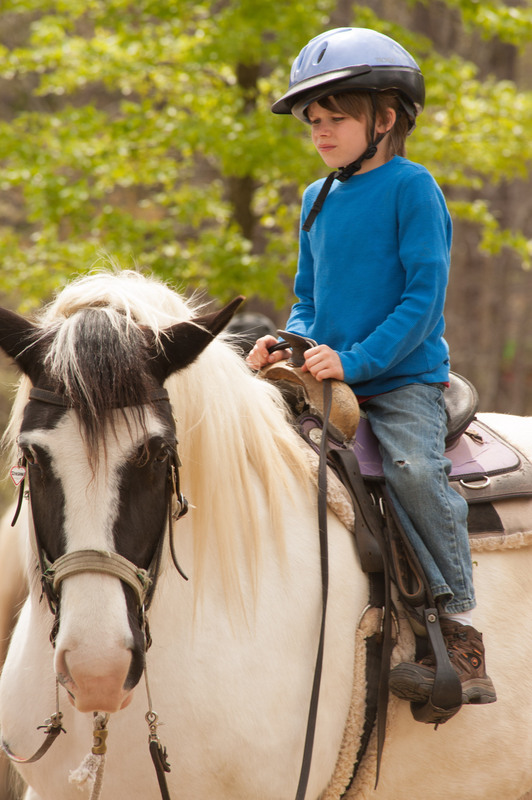 We provide experienced guides, riding instructions, and riding helmets at no additional charge. 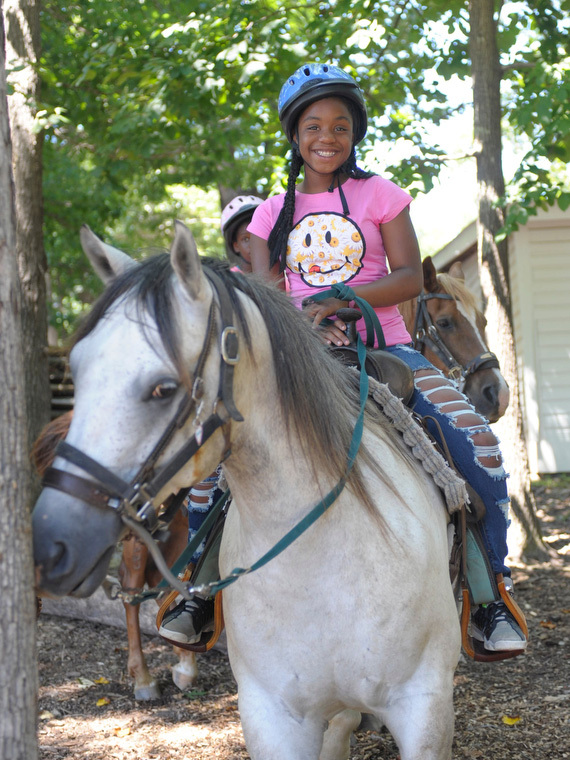 Ages 6 and up can ride at our farm and will get a horse of their own. We want to make horseback riding available and accessible to everyone, so we have at least 12 draft horses (similar to the Budweiser Clydsdales who pull the beer wagon) to accommodate larger riders. We can take riders weighing up to 450 lbs because our draft horses are very large boned and weigh 2,000 to 2,500 pounds themselves. However, they are gentle giants and very well mannered. You can see one of our Clydesdales in the picture to the left. We have mounting blocks, and we will assist you in mounting and dismounting as we do all our riders. Our draft horses eat more than twice the amount of a regular size horse, and the shoeing expense is more than double, as the shoes are more expensive and a forge must be used to heat the shoes so that they can be shaped to fit the horse's hoof. 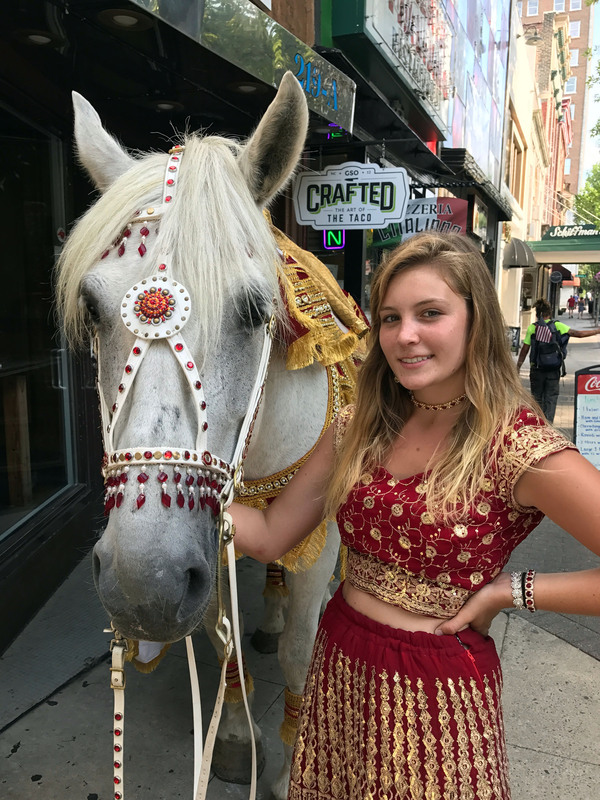 Due to the added expense of maintaining the draft horses, we charge an additional $10/person for anyone who needs to ride one, i.e. anyone weighing over 200 lbs. Please be honest when making your reservations, as we will have scales accessible to verify the riders' weights at check-in to ensure that we don't compromise the health of our horses. While we recognize that a person's weight may be a sensitive subject, we have an overwhelming commitment to preserve the backbones of our buisness - literally and figuratively. We have a variety of rides that children ages two and up can participate in. They can ride on their own when they are six years old and up. 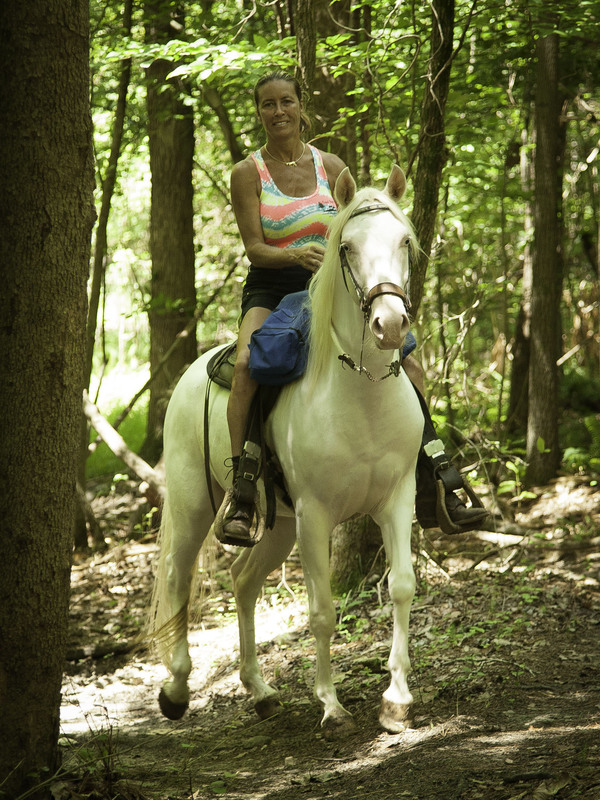 If they are younger than six, they can do the 1-hour trail ride along with the rest of the family, but they will ride double with one of DBF's experienced guides. Sometimes six year-olds are fearful of riding on their own on such a big animal, so we give them the option of riding on their own or riding with a guide. However, if your six year-old prefers to ride with a guide, you will need to indicate that on the reservation request. Otherwise, we will assume they are riding on their own. Little girls are provided with female guides. Children ride in front of the guide as it's safer than having them ride behind the guide in a buddy seat, and it allows them to see and participate along with the rest of the family, but their guide controls their horse for them. 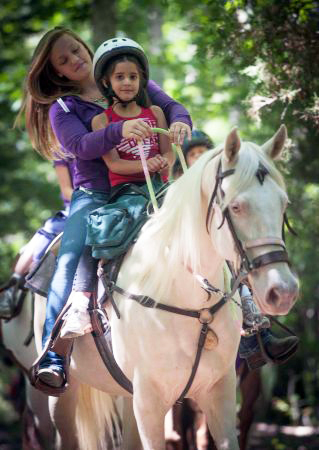 We use big, oversized saddles so that both the guide and the child can be comfortable. Children are never permitted to ride double with a parent because of safety concerns. In addition to our regular rate, there is a $10 fee to help us offset the cost of the guide dedicated to providing your young child with a safe riding experience. 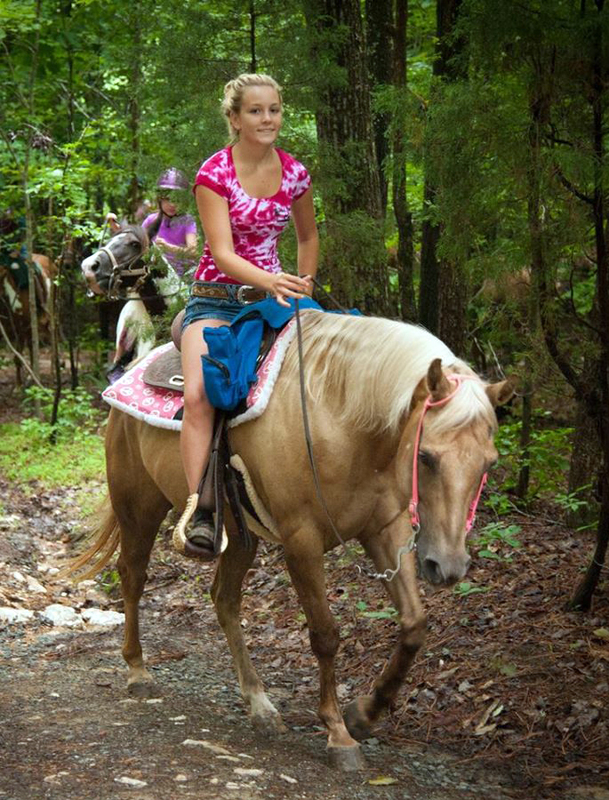 Another option for children under the age of six is a "pony ride" - a hand-led mini trail ride through the woods on horseback. And there's no upper age restriction either. You're never too old to ride. If you have the desire, we will help you up onto your horse and help ensure that you have a safe ride. 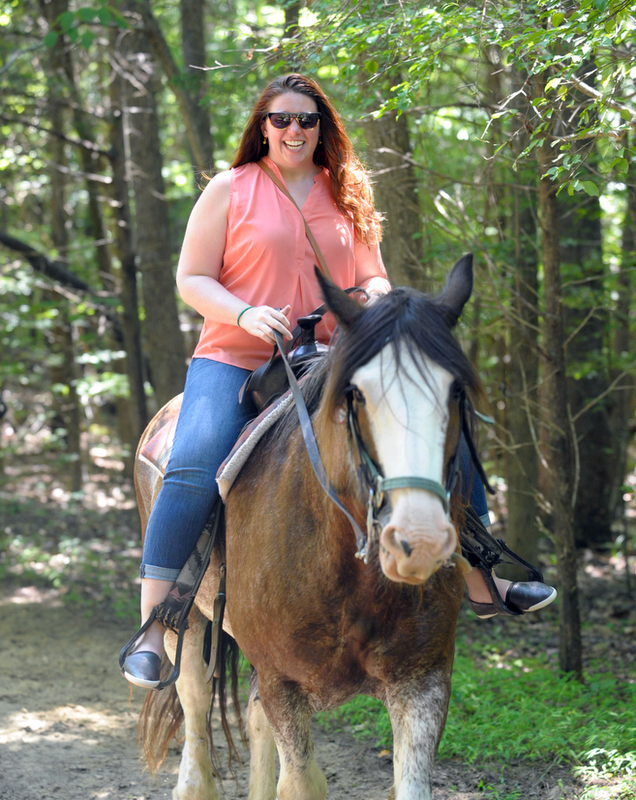 So get taken for a ride at Dead Broke Farm, and let your horseback riding adventures begin! When you reserve horses to ride, those horses can't be used for anyone else during that time, so we have a no refund policy. Therefore, if you or your child get on the horse and then get scared and don't want to ride, you may elect not to ride, but you aren't entitled to a refund. We have already done the work to bring the horses up from their pastures, groomed them, saddled them, given you riding instruction, and helped you safely on the horse. All that's left to do is ride. That's the easy part. Deposits are nonrefundable, so please be certain that you wish you ride when you make a reservation. If you need to reschedule for any reason (weather, illness, or even convenience), we're happy to reschedule your ride for you and apply your deposit to the new reservation provided at least 2 hours' notice is given.